Recent statements by Iran's top leadership cast doubt on the nuclear deal's viability even though the congressional effort to disapprove the deal appears dead in the water. Iran's Supreme Leader Ali Khamenei says all bets are off on this deal if the Islamic Republic is found in violation of the deal and the U.S. and E.U. try to re-impose sanctions. "If the sanctions are not due to be removed, then there will be no deal either. Hence, there needs to be a decision to be taken in this regard," Khamenei said Sept. 3. 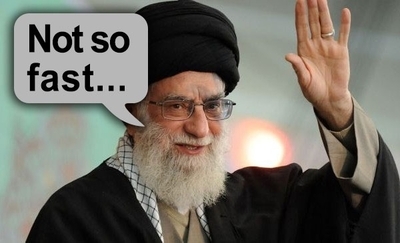 Khamenei threatened that Iran would merely suspend its nuclear ambitions if the sanctions relief was only temporary. "We negotiated so that the sanctions framework will be eliminated and that sanctions in general will be lifted. So, is the sanctions framework supposed to remain in place? Now, I do not know what they mean by 'the sanctions framework,'" Khamenei said in a Sept. 3 speech. "They might define it in a different way in the future as well, but what we understand from this statement is the exact opposite of the reason why we took part in the negotiations. Otherwise, there would be no need for us to negotiate." Last April, Iran's parliament made an immediate lifting of all sanctions on the Islamic Republic a condition of any agreement. Opposition to the snapback clause in the deal remains in Iran's parliament. During discussions Wednesday, Deputy Foreign Minister Seyed Abbas Araghchi told members of Iran's parliament that either side could pull out of the agreement if they decide the other side violated the agreement. "Commitment to the JCPOA (Joint Comprehensive Plan of Action) is a two-sided issue. Each side can nullify the JCPOA, but this would result in the other party's exit from the agreement as well," Araghchi said. That raises problems, considering Parliament Speaker Ali Larijani told NPR that his country has a different interpretation of the deal than the U.S., particularly where sanctions are concerned. State Department officials say they have contingency plans to ensure sanctions are "effectively suspended and can be snapped back in the future." In addition to possible "snapback" sanctions, the ayatollah and other Iranian leaders likely fear new sanctions over Iran's support for terrorism and its holding of four American hostages, Heritage Foundation Middle East expert James Phillips told the Investigative Project on Terrorism (IPT). Iran's leadership views the agreement as a means to get sanctions lifted permanently and preserve its nuclear program, former U.S Ambassador to the United Nations John Bolton told the IPT. "The Iranians—the so-called moderate Iranians wanted the sanctions lifted more than the hardliners; none of them were willing to debate concessions on their nuclear program, and they were able to accomplish what they wanted to get the sanctions lifted, the assets unfrozen, and they didn't make significant compromises on the program," Bolton said. Iran's leaders expressed triumph in getting the West to back down from the sanctions. Sanctions could not be effectively used as a weapon or tool of "bullying," Larijani told Iran's Mehr News Service on Sept. 1, while Iran's Foreign Ministry described the agreement as a win because the U.S. acknowledged its right to enrich uranium. Iran's Leadership Rejects Improved Relations With the U.S.
Iranian quibbling about the deal comes as the nation's leaders continue their vitriolic anti-American rhetoric. Khamenei reiterated in a Sept. 9 speech that he still views America as the "Great Satan," saying that his country expelled America in its 1979 revolution and would never let it return. "Now that we have thrown him out of the door, we should not allow him come in through the window. We should not let him penetrate because his enmity will not come to an end," Khamenei said. Khamenei called America and Israel "our enemies" in an Aug. 27 speech during a discussion of Iran's economic woes. Earlier in August, he claimed that Iran blocked America's effort to exert influence using sanctions and dashed any hopes of widespread U.S.-Iranian rapprochement. Countering American influence in the Middle East remains part of Khamenei's Iranian policy. "We will not allow the Americans to have economic or political influence in our country, nor will we allow them to have a political presence and cultural influence in our country. We will confront them with all our power which is thankfully great in the present time. The same is true of the region," Khamenei said. Signs already suggest that Iran is unwilling to give IAEA inspectors unrestricted access administration officials say is part of the deal. This could undermine President Obama's contention that the deal "is not based on trust; it is built on verification." "Iran does not plan to issue permission for the IAEA (International Atomic Energy Agency) to inspect every site," Defense Minister Brigadier General Hossein Dehqan said earlier this month. In July, Dehqan also said that Iran would block inspections at many of Iran's military sites and that Iran would not allow any foreigner to discover his country's defensive and missile capabilities. This is a consistent message from Iran. "The access of inspectors from the International Atomic Energy Agency or from any other body to Iran's military centers is forbidden," Khamenei's aide told Al-Jazeera's Arabic service 11 days after the deal was announced. Iran's President Hasan Rouhani previously bragged in 2005 about how his country had duped the world following its alleged stoppage of uranium enrichment in 2003, Bolton said. "He gave a speech in Iran in Farsi where he talked about how in 2003 and 2004 he had taken the Europeans for a ride. That deceiving them about moratoria and their enrichment-related activities, and a series of other step that they took to appear to be negotiating in good faith, when in fact, they weren't," Bolton said. "I take ... all of these so called moderates to be just as great enthusiasts for the nuclear weapons program as Khamenei himself." In the last decade, Iran did everything it could to hamper the IAEA's inspections efforts. The U.N. agency reprimanded Iran for noncompliance with international standards in June 2004. Then IAEA Director General Mohamed ElBaradei slapped down Iran's claim – one it still maintains – that its nuclear program strictly had peaceful purposes, noting that inspectors found highly enriched uranium particles at a number of Iranian nuclear facilities. Bolton predicts Iran will play nice at first and comply with the agreement for the six months or so to get the sanctions lifted and the country's assets unfrozen; however, the IAEA will run into trouble "almost immediately." Iran's refusal to allow inspections of its military sites leaves opportunities for continued clandestine work on its nuclear program. "I think the level of cooperation that Iran will demonstrate once the sanctions are lifted will fall and I think we're going to be right back into an endless negotiation. And you can hear even our own State Department and European allies saying, 'Do we really want to jettison the entire Vienna agreement just for minor kerfuffles over this or that alleged noncompliance?'" Bolton said. Iran will comply with the terms of the agreement as long as it's in their best interest, Phillips said. Problems will arise once Iran gets the sanctions relief, he predicted, and it will start to dig in its heels. Under the deal, Iran is supposed to reduce its centrifuges from 19,000 to 6,104, limit uranium enrichment to 3.67 percent for 15 years, build no new enrichment facilities for 15 years, ship spent fuel from its Arak heavy-water reactor and refrain from producing more heavy-water reactors in the future. Iran must show that it has kept its end of the bargain before it can receive sanctions relief, State Department officials told reporters Thursday. This includes placing thousands of centrifuges out of service at its Natanz site, placing them into IAEA-monitored storage; removing enrichment equipment from its Fordow site; and filling the core of the Arak reactor with concrete to make it unusable. The agreement's stipulation allowing Iran to delay inspectors up to 24 days undermines their verification abilities, U.S. Sen. James Lankford, R-Okla., told the IPT. The type of equipment used at covert Iranian nuclear sites can easily be sanitized and equipment at smaller covert sites moved during a 24-day delay, former IAEA Deputy Director Olli Heinonen said in July. Iran could use the opportunity to "sanitize" its small, covert nuclear sites by installing new floors, putting new tiles on the wall, painting ceilings and removing ventilation. "If you take a small place like where you do uranium metallurgy or manufacture nuclear parts for a warhead, that is a very small place, and 24 days gives you, perhaps if it (inspections) is planned enough in advance, time to conceal it," Heinonen told the IPT. Lankford believes the situation that will prevail under the agreement will be a "hide-and-seek game" where inspectors must look for a "magic bullet" in a country the size of Texas. "Much of the work on nuclear weapons doesn't center around uranium—it centers around other technology, so you're literally hiding it in a computer network somewhere, and if you're able to do that, you can hide it anywhere in a nation that large, so there's no real way to verify," Lankford said. "So we need to focus on verification. The main focus they have is on uranium enrichment, and, as I already mentioned, the Iranians already know how to do uranium enrichment at this point. "Everything is centered around the speed of that enrichment, the quality of that enrichment, the triggering devices, the delivery devices." Since 2005, Iran has blocked inspectors from interviewing its nuclear scientists and from freely visiting sites such as its military base at Parchin, which remains a matter of controversy from Iran's perspective. Reza Najafi, Iran's ambassador to the IAEA, reiterated his country's refusal to allow inspections at Parchin in August. Satellite imagery shows new construction at the site, which the IAEA wants access to. "Iran has no need to get permission from the [International Atomic Energy Agency] for construction in its own sites," Najafi said regarding IAEA's desire to inspect Parchin, according to Iran's semi-official Tasnim News Agency. Iran barred IAEA inspectors from the country in 2010 after they uncovered evidence of illicit nuclear activity. In other cases, Iran systematically objected to nuclear inspectors in what an IAEA report described as spurious grounds. Following the agreement, Iran and the IAEA struck a deal that Iranian authorities demanded be kept secret to prevent Western intelligence agencies from exploiting the information. Giving the IAEA unrestricted access to all relevant Iranian military sites is essential, Heinonen told the IPT. Without such access, the IAEA cannot do its job. "There's no shortcut here," Heinonen said. "Access has to be there. If IAEA cannot do it, then it cannot do the verification to the standard, which is required. "The other part of the safeguards agreement requires that all nuclear material in Iran, regardless of where it is, has to be declared to the IAEA, and it includes also activities and materials at military sites." "Iran," he said, "has an obligation to cooperate with the IAEA." Refusal to comply with inspections would constitute a breach of the agreement, Heinonen said. Iranian rhetoric about placing conditions on inspections suggests that this deal will likely go the way of earlier deals, Phillips said, such as the 2005 agreement to export Iran's enriched uranium that Khamenei quashed. Hopes that Iran will abide by the agreement after it secures the sanctions relief is "wishful thinking" because the Islamic republic has consistently balked and hampered inspections in prior deals, Phillips said. Consequently, whether or not the agreement sticks will be up to the mullahs in Iran.